Purple Pepino melons are oval and have an elongated shape that tapers to a point at the end. They are larger than yellow varieties and measure 15 centimeters long and 6 centimeters wide. The smooth skin is thin, light purple and covered in dark purple striations. 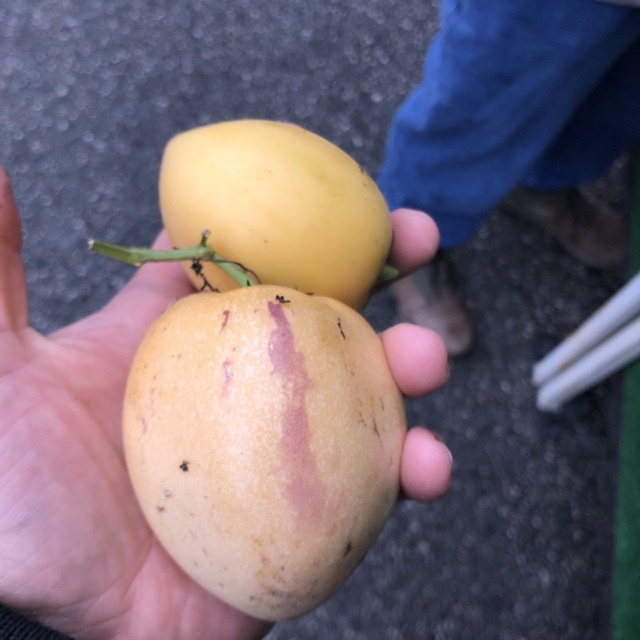 When fully ripe, the flesh of a Purple Pepino melon is dark yellow to pale orange with a juicy, melon-like texture and sweet, honeyed aroma and flavor. At the center is a shallow cavity containing small, edible seeds. Purple Pepino melons are available in the summer and through the fall months. Purple Pepino melons are tropical fruits botanically classified as Solanum muricatum. They are not melons nor are they related to melons; pepino fruits are in the nightshade family, related to the tomato and eggplant. They are sometimes called Purple Melon Pear or Pepino Dulce morado. In Indonesia, they are called Buah Pepino and are sometimes referred to as Melodic Fruit. The purple variety is rarer than the yellow variety outside of the Andes region, New Zealand and Indonesia. Purple Pepino melons are a good source of beta-carotene, vitamin C, and potassium, and are rich in dietary fiber. They are very hydrating with water making up 95% of the fruit’s content. The purple fruits contain flavonoids and phenols which provide antioxidant benefits. They are also low on the glycemic scale and ideal for those on a diabetic diet. Purple Pepino melons are typically eaten raw and chilled. The skin of fully ripened fruits is edible and can be left on or removed depending on taste. They can be cut into quarters or slices. The pulp can be scooped from the skin and added to smoothies or pureed for beverages. The whole fruit can be juiced, though the skin may add some bitterness to the flavor. Purple Pepino melons are highly perishable and will keep for 2 to 3 days in the refrigerator. In Malaysia, Purple Pepino melon can be found in markets of the Cameron Highlands, where they are often sold as “Cameron apple”. The fruit is sold primarily to tourists visiting the island, which has earned it the nickname “tourist fruit.” The Cameron Highlands is located just over 90 miles (150 kilometers) north of Kuala Lumpur and is the largest tea-producing region in Malaysia. Outside of this area, Purple Pepino melon is called Pepino Ungu in Indonesian. Purple Pepino melons are native to the Andean region of South America, where they were called “cachum” or “cachuma” by the people of Colombia, Peru and Chile. The Spanish gave it the name “pepino” because it resembled a cucumber, adding the descriptor ‘dulce’ to differentiate between the two. The Spanish brought Pepino melons to Europe and they were brought to New Zealand and Indonesia sometime during the 19th century. In Malaysia and Indonesia, the fruits are also used for medicinal purposes and are often used to treat digestive disorders. 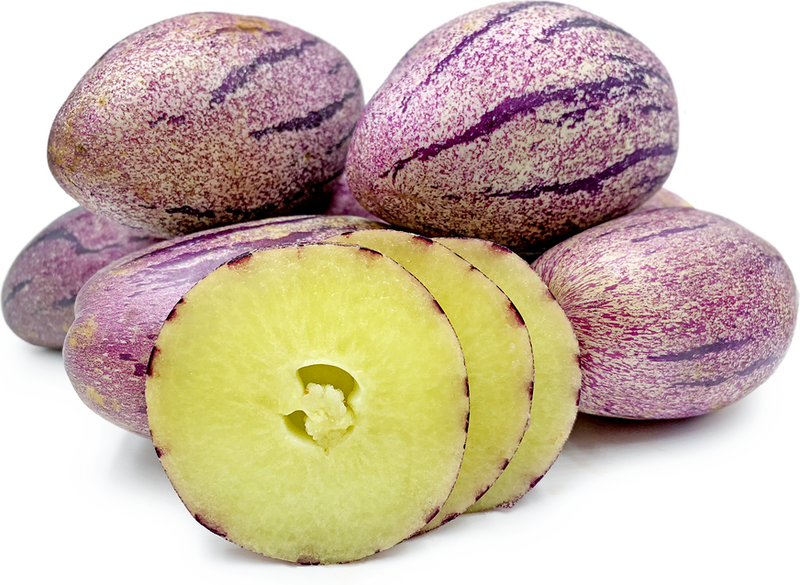 New Zealand botanists are developing improved Purple Pepino melon varieties, like the large Hortcolomb. Purple Pepino melons grow well above sea level in cooler, temperate regions and are most likely spotted in parts of Malaysia, New Zealand, Western Australia, and Chile. Someone shared Purple Pepinos using the Specialty Produce app for iPhone and Android.